Our open-air design is perfect for indoor, outdoor, large and small events. Our state-of-the-art machine tilts and zooms, and we can easily accomodate up to 20 guests in a single session! We are a fabulous focal point for any kind of photographic event from wedding receptions and proms to birthday parties and family reunions, large corporate and red carpet events, even Santa and other holiday shoots! Our professional DSLR cameras and studio lighting provide the best quality images possible, and our high-speed printers crank out bright, color-fast photo strips in record time! Our huge assortment of whacky props makes it fun to come back again and again! We always include free customization of the photostrip captions for your event, and you get to choose the number of photos per session (1-4). We can print 2x6 photostrips or full 4x6s with an almost limitless template library or using a design of your creation! Choose your backdrop from our selection, provide your own or even use a natural backdrop at your venue! NO WORK AND ALL FUN FOR YOU! Our booths practically run themselves, but our packages always include a friendly, knowledgeable attendant to make sure everything runs smoothly so that all your guests have a fantastic experience. And set up and tear down/clean up time is free to you! 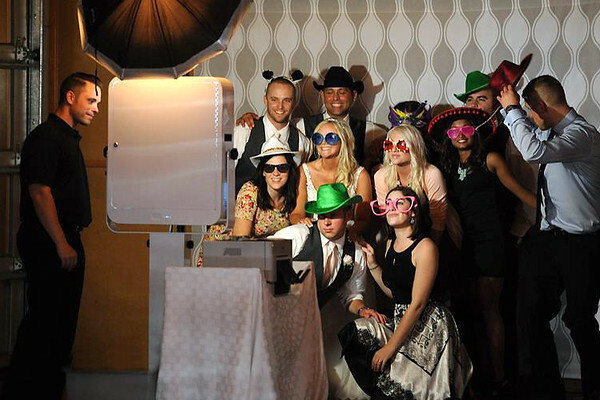 Each photostrip includes a link to a private, online album of images from your event. Within 24 hours of the event, your guests will have free access to the high-quality individual digital photos and photostrips to share and print! We require completion of a contract and a $200 deposit to reserve a booth. All prices are subject to Washington State Sales Tax.